How does Melatonin Impact Sleep? Home » Blog » How does Melatonin Impact Sleep? If you have trouble sleeping, sooner or later, you may consider taking melatonin. Melatonin is a hormone made by a small gland in the brain; when it is dark, this hormone is released into the bloodstream and tells our body that it is night and time to start winding down for sleep. 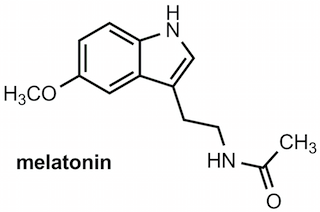 Melatonin release causes physiological changes such as slower heartbeat and lower blood-pressure, and many people fall asleep within 1-3 hours of melatonin release. One key function of melatonin is to help regulate our sleep and wake cycles. Further, melatonin is an antioxidant and is thought to protect against cancers, diabetes, and even to slow brain aging. Our bodies produce melatonin naturally and we also get melatonin in our diet from some foods that we eat, such as tart cherries. As we get older we are thought to produce less melatonin, which is why melatonin is sometimes referred to as the “hormone of youth.” For this reason, some people recommend melatonin supplements to those 55 years and older. However, melatonin supplements vary widely in dose (from 0.1-10mg), and higher doses can cause blood levels of melatonin to rise up to 20 times above normal levels. For this reason, some people recommend taking the lowest doses available if they are effective (0.1-0.3mg). Also, taking melatonin at the wrong time of day (in the daytime) can make one sleepy and “brain-fogged”, as well as having other potential adverse consequences. That’s why you don’t want to take a melatonin supplement in the morning before heading off to work, for example. Melatonin supplements may help with some sleep problems for some people. There is some controversy, however, about what the best dose is and when the best time to take melatonin before bed is, as well as which sleep problems it is best suited for, and whether it is even effective for sleep problems. While there seems to be a consensus that melatonin supplements are safe for short-term use, not enough research has been conducted to ensure melatonin is safe after prolonged use. Further, it’s important that you check with a doctor before taking melatonin, as interactions with other drugs have been listed. However, in the past 25 years since melatonin supplements have been available, there have been no reports of melatonin toxicity or overdose.